Member of the Standing Committee of the Political Bureau of the CPC Central Committee, chairman of the Tenth National Committee of the Chinese People's Political Consultative Conference and secretary of its Leading Party Members' Group. 1956-1958: Student majoring in industrial enterprise planning in Shijiazhuang Industrial Management School. 1958-1962: Student majoring in electric motor and appliance design and manufacturing of the Department of Electric Power of Hebei Engineering College. 1962-1969: Technician of the Complete Plant Bureau of the First Ministry of Machine-Building Industry and deputy secretary of its CYLC committee. 1969-1971; Sent to do manual labor in the May 7th Cadre School of the First Ministry of Machine-Building Industry in Fengxin County, Jiangxi Province. 1971-1973: Technician of the Policy Research Office of the General Office of the First Ministry of Machine-Building Industry. 1988-1990: Deputy secretary of the CPC Fujian Provincial Committee, president of the Party School of the CPC Provincial Committee and secretary of the Work Committee of Departments under the CPC Provincial Committee. 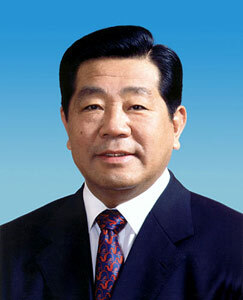 1990-1991: Deputy secretary of the CPC Fujian Provincial Committee and acting governor of Fujian Province. 1996-1997: Deputy secretary of the CPC Beijing Municipal Committee, acting mayor and mayor of Beijing. 2002-2003: Member of the Standing Committee of the Political Bureau of the CPC Central Committee. 2003- : Member of the Standing Committee of the Political Bureau of the CPC Central Committee, chairman of the Tenth National Committee of CPPCC and secretary of its Leading Party Members' Group. Member of the Fourteenth through Seventeenth CPC Central Committees. Member of the Political Bureau of the Fifteenth CPC Central Committee. Member and Standing Committee member of the Political Bureau of the Sixteenth and Seventeenth CPC Central Committees. Chairman of the Tenth National Committee of CPPCC.